The AFL-CIO launched their 2012 Executive PayWatch site—now called CEO Pay and the 99%—which includes the most comprehensive data accessible on 2011 executive pay. Yesterday, the Florida Senate rejected SB 2038, Gov. 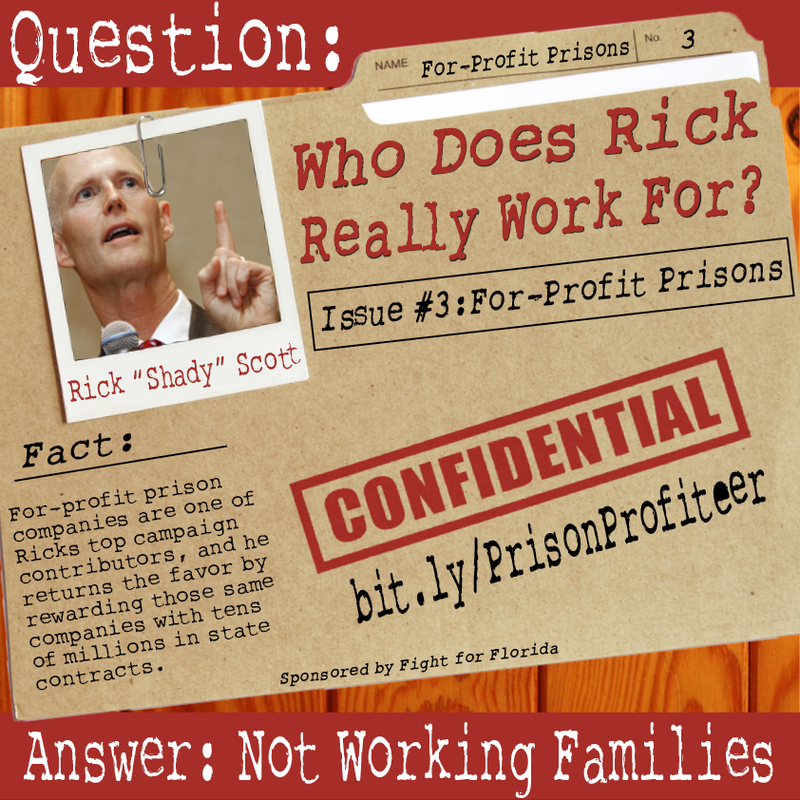 Rick Scott’s prison privatization scheme. The victory was the clear result of an outpouring of public support for correctional officers and prison workers along with disgust over private prison contractors’ attempts to subvert our democracy. Prison Privatization Vote Coming Soon. Call Today! All hands on deck! Senate President Haridopolos and Rick Scott will Attempt to Ram Prison Privatization through the Senate Tomorrow! On Monday and Tuesday the Senate will convene to vote on SB 2038, the prison privatization bill. We’ve seen this movie before, as the Tampa Bay Times points out: It’s easy to tell when Florida’s leaders in Tallahassee are trying to ram through legislation that would not pass on its merits. (Tallahassee, FL) Working Floridians today said the Legislatures’ scheme to hand over state prisons to private companies will hurt families and communities, while increasing the dangers posed by violent criminals. Rick Scott and some Legislators in Tallahassee are pushing the most dangerous bills imaginable. Two bills, SB 2036 and SB 2038, aim to privatize many governmental services and agencies without the public having a voice in the process. Two destructive bills are being rushed through by Gov. Rick Scott and his cronies in the Legislature that would essentially keep privatization efforts in the dark, away from the view of Florida taxpayers. On Tuesday, September 27, from 4 p.m. to 5:30 p.m. (local time), members of the four employee unions of the United States Postal Service— • American Postal Workers Union • National Association of Letter Carriers • National Postal Mail Handlers Union • National Rural Letter Carriers’ Association —will join forces with members of our communities to send a message to the nation and its Congress.